Welcome to the idyllic Peyton Island off the coast of the British Isles, population less than five thousand. The perfect place for a quiet life, or is it? Peyton is guided by old time values and a solid community spirit, separated from the mainland it has avoided the spoils of modern living and seems to be an ideal place to live. But when darkness falls a strict curfew prohibits its residents from going out, a curfew enforced by the Patrol Men. The inhabitants of the Island want change, can they overthrow the powers that be without become victim to the terror that is the Patrol Men? Not a lot is known yet about Patrol Men, the debut feature from writer-producer Niall Maher and writer-directors David Campion and Ben Simpson. Actually, while we're talking debut features it's also worth mentioning stars Chloe Van Harding and Ian Fielding, who are also making their feature debuts here, though their co-stars Anthony Abuah, Josh Golga and Marcus Gray are hardly movie veterans. What we do know is that the PR people are pushing is a cult British horror film in the making. We shall see. 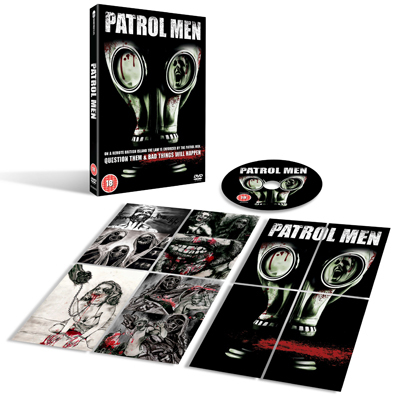 You'll get a chance to find out more on the 28th March 2011 when Patrol Men is released on UK DVD by Crabtree Films at the RRP of £12.99. No news yet on any extra features, but the packaging is rather nice.